South Dakota's state building resembled an old missions in the Spanish architectural style. The modest building covered 74 by 86 feet and cost 8,000 dollars. 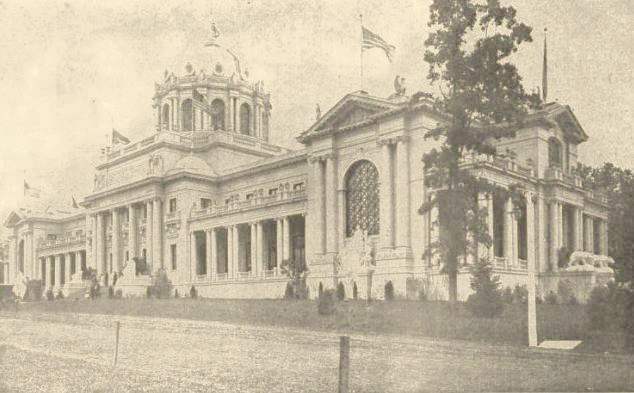 Although one of the last of the states to procure ground for the erection of our State building, the South Dakota Building was one of the three state buildings ready to open its doors on the opening day of the Exposition. 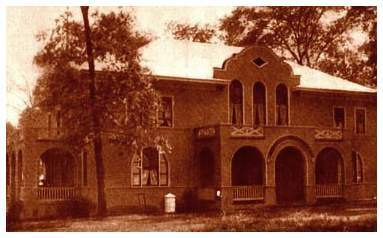 The building was two stories in height, having two porches on the north and west sides; the outside walls were covered with cement, finished in natural color. avatories, and storage room. The walls and ceilings of all the rooms were covered with metallic sheeting with embossed designs. Photographs of cities and scenic beauty were displayed. The most eye-catching room was "The Great Corn Room." Art work out of fruits and grains were fashioned on the walls. Poems were written with blades of grass. The second floor contained living quarters for the custodian of the building and officials. A 800-seat restaurant was on premises and was available to the public. South Dakota won 10 medals to its horticultural displays. In the Palace of Agriculture their corn display was similar in construct to the `Great Corn Room;' over 100 bushels of corn was used in this exhibit alone. The interior of the South Dakota Building. The interior wall was made out of different cerals, every county from the state was representated by a panel. The stairway on the left, led to the Commissioner's office. 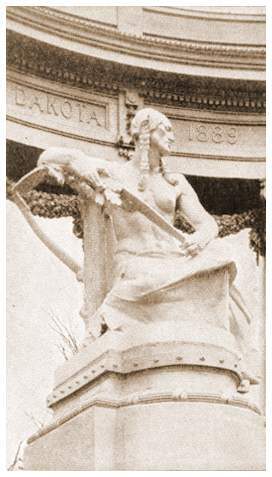 The South Dakota statue at the Colonnade of States. The piece was sculptured by L. O. Lawrie.